Let's take a trip back to the summer of 2009. I had recently returned from a failed attempt at moving away from Portland- failed because apparently distance does indeed make the heart grow fonder. I missed this wet and ridiculous city. I wanted it back as soon as it was in the rearview. The Portland I returned to was not quite the Portland I left six months earlier. Friends had moved away, and more were planning to leave. I was about to be living in a city of acquaintances, fake friends, and ex-boyfriends. This sounds kind of terrible but it was really the best thing that could have ever happened. I started doing stuff that I had always loved doing... Exploring, taking little adventures with Jake, taking pictures, really truly appreciating this amazing place where I lived. The more little adventures I took, the more I wanted to take. The more things I saw, the more I wanted to know what they were. I've mentioned the Osprey at Kelley Point Park before. It was one of the first birds that just blew me away- not only was it a gorgeous bird, but how the HELL had I never noticed one before? I had always wished I had some kind obsession. A passion. Something I just loved. Dudes I dated were obsessed with their bands, or taking apart motorcycles, or taking apart amps (ok that was all the same dude, but you get the idea). I never really had that. But as I kept up my adventures, my photos were starting to shift focus... Less photos of Jake, more photos of birds. I think you can see where this is going. I remember that moment. That was when it clicked: holy effin crap (that's the edited version), I found something I love. I loved the birds, I loved taking their pictures, I loved exploring new places and finding these seemingly magical and secret spots. I was hooked on the whole thing. A week later I started this blog. I wanted to remember these places. These birds. Look up their names and learn what they were all about. Share them with my mom, who always loved birds. So what's up next for i used to hate birds? FOUR MORE YEARS! FOUR MORE YEARS! Yeah? Maybe. Who knows. I've learned a lot from this thing, why not learn some more? Lastly, I want to say thanks to you all. You've made this journey a pretty fantastic one. High fives all around. You guys rule. Cheers! Nice. Sentimental and real nice. Huzzah! SO MUCH SENTIMENT! Very good post. I already knew a lot of the story but you put it all very well...congrats on 4 years! Happy Anniversary!! I love me some storytime. Keep on nerding out! Happy Anniversary, Jen! I enjoy your blog and seeing your birds, scenery and dogs. Looking forward to many more years. Happy birding and have a great week! WOW..Jen has it been 4 yrs already??? I think I've been with you all the way (almost),,, and I've watched you grow into my Idol when it comes to birding...your blog is always fun,exciting, and I've learned a lotttt from these pages! So big congrats and have another round--AND wanna ask Where did you get that awesome stove on tall legs? My sis is looking for one similar? Glad you got rid of the baggage and found yourself along the way!!! thank you!! we are going to check that website right now! Aww.. I'm wiping tears away ;) It's been fun being with you from the beginning. You are the most consistent bird nerd blogger I know and its always fun to read your adventures. Keep it up! I raise a Jubelale of my own to you and your wonderful blog. Your dry humor and fun photos make your blog one of my favorites. Keep up the good work! 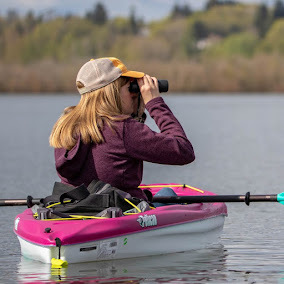 Jen, Wonderful post about how you got into birding and doing your blog! I've always wondered and now I know. Great story and neat photos to go along with it, Jen. To be 213 on the birding top 1000 is so excellent, too. I'm lucky to get into the 700's. You are consistently near the top with your informative and fun to read blog posts. And, your skill at finding and ID'ing birds, doesn't hurt any! Keep up the good work, Jen! Happy Anniversary! Congratulations on the 4 years! Your personality and humor made this an entertaining post to read too.